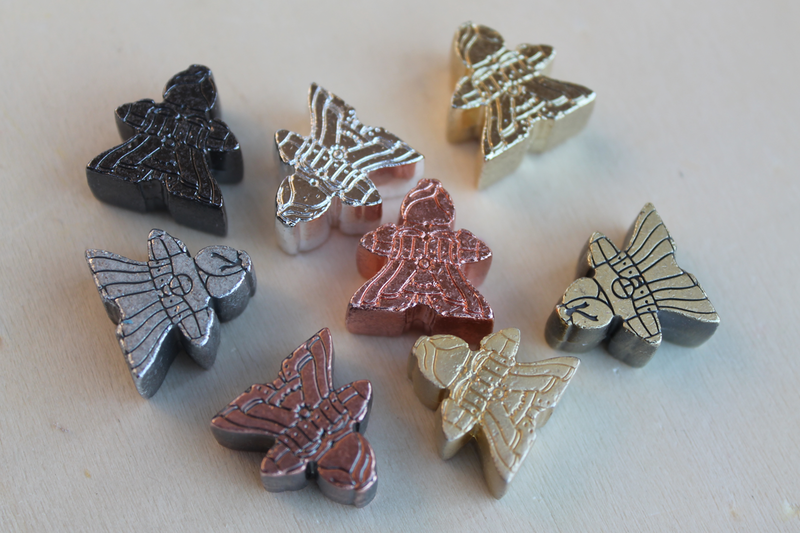 It’s time to follow up on the Meeple Mayhem post. Past time, actually, but life is busy. 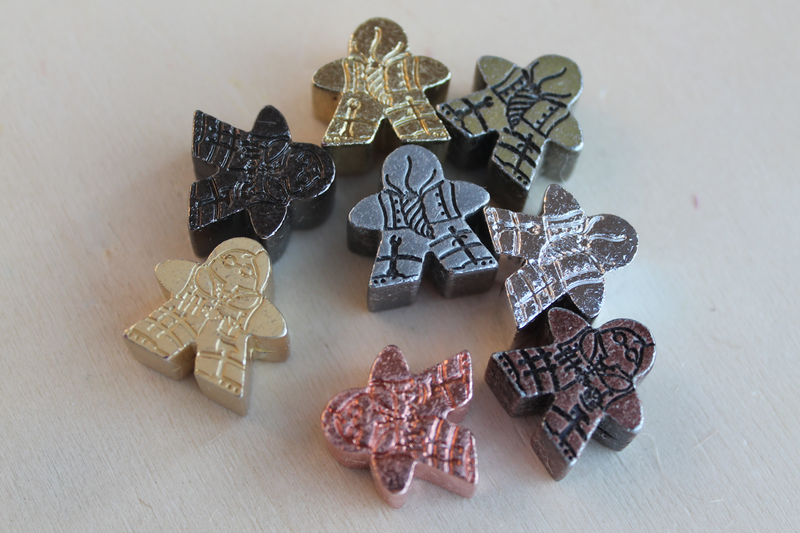 I promised to do some damage to some meeples last time. I didn’t get to do quite what I had planned, but I did get to send them through a cycle and a half in the clothes dryer. I figured that the warmth, slightly elevated humidity and constant agitation could simulate wear and tear of backpacks and pockets well enough to get some bead on what might happen over time with them. For the most part, it looks like the bag that they were in doesn’t make much difference. They all wound up dinged a bit, and there are the occasional bits of plating that come off, most notable on the antiqued copper. This isn’t a surprise, but it’s nice to have some photos to show what happened. 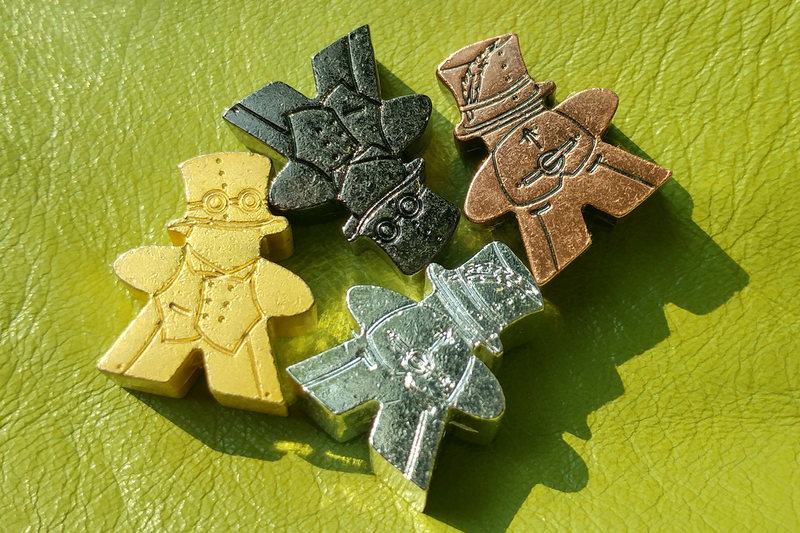 I did run into a weird event where it looks like the Top Hat male first generation Tinker meeple, finished in “Misty Gold”, wound up mostly stripped of gold. 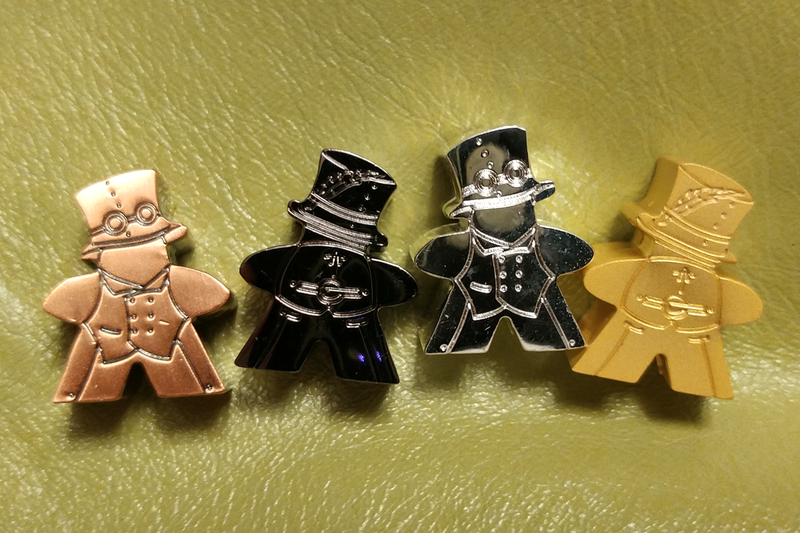 None of the other designs had this happen for their Misty Gold, though, and looking back at the “before” photo, I can’t be sure that I actually had a Misty Gold Top Hat meeple in the batch in the first place. I grabbed one from each of my bins, but maybe the one that I thought was Misty Gold was actually another Antiqued Silver. 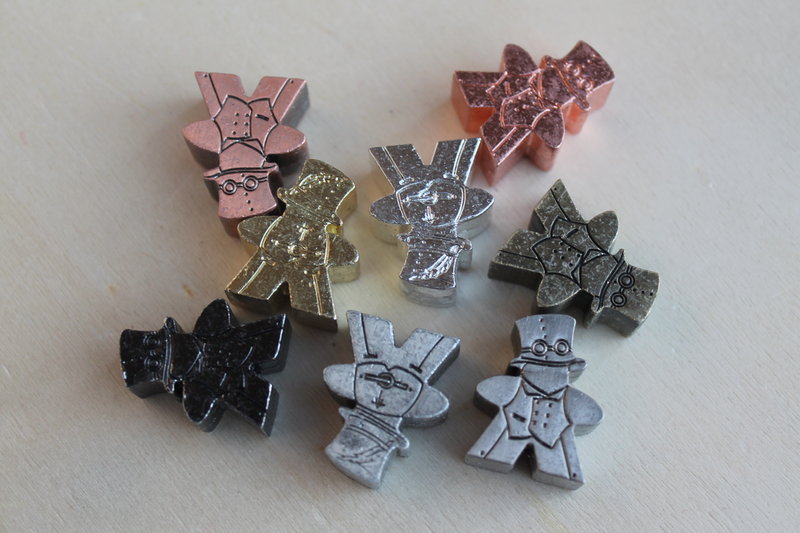 So, I did another experiment with just 4 Top Hat meeples, making sure that there was a Misty Gold in the mix. This one didn’t have a big problem, though it did show a bit more wear than the other colors (mostly some thinning in the face area, no big chips or scrapes). As such, I think that for the most part, I’m happy with how these worked out. The Misty Gold Top Hat does disappoint me a bit, but gold is soft, so this isn’t shocking, sadly. I wish I could say with impunity that these little folk were incredibly durable, but it’s just a reality that any plated metal will have this sort of issue. 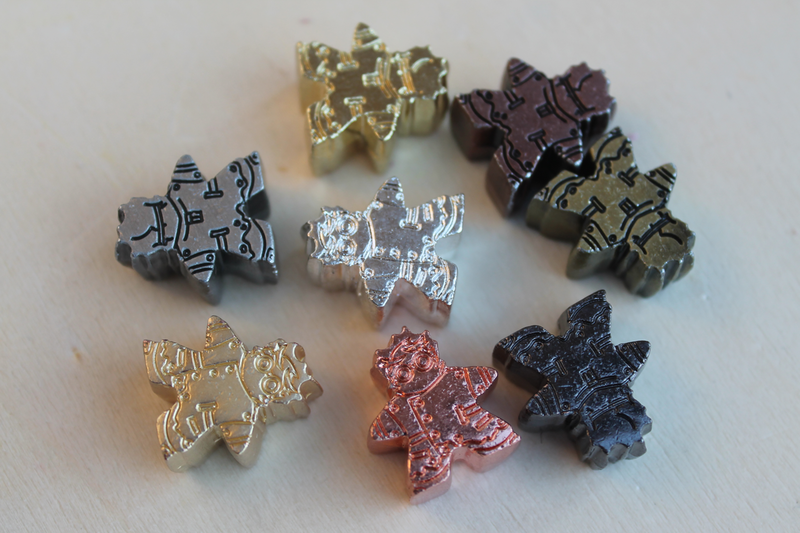 We can’t really make solid copper or solid gold meeples… though that would certainly be a blast if we could say we did and they sold enough to make it worthwhile. 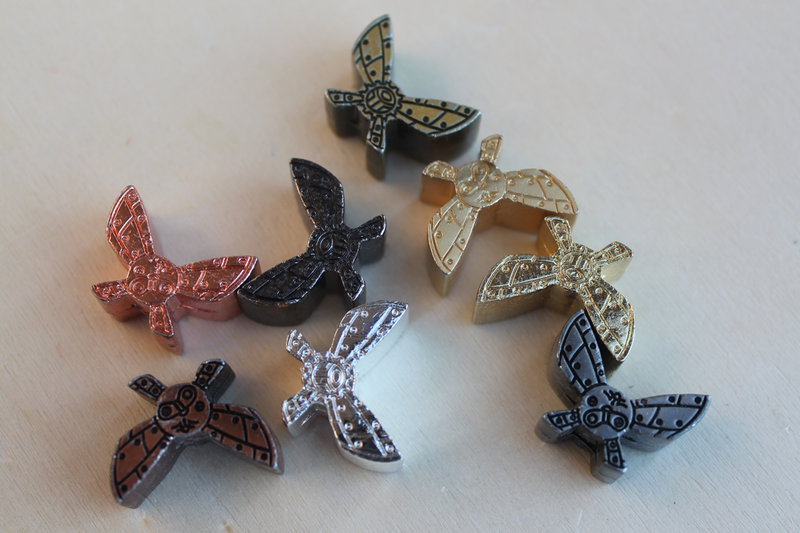 At any rate, overall I’m sufficiently pleased with the overall durability, since the zinc alloy core is plenty tough. The dings and scrapes that come with life as a metal are just part of the bargain in my book, but it’s nice to finally have some photos to show off. It might also be worth noting that this just simulates mechanical wear and tear. I haven’t found a great way to simulate months and/or years of handling with the natural oils on human skin. I suspect that such would be a surface issue, though, so you’re likely to see the same sort of effects that you might have with other metallic items, like truly silver silverware or copper coins.